WorldMovieStore - Tora! Tora! Tora! The epic film shows the bombing of Pearl Harbor from both sides in the historic first American-Japanese coproduction: American director Richard Fleischer oversaw the complicated production (the Japanese sequences were directed by Toshio Masuda and Kinji Fukasaku, after Akira Kurosawa withdrew from the film), wrestling a sprawling story with dozens of characters into a manageable, fairly easy-to-follow film. While Tora! Tora! Tora! "Tora! Tora! Tora! Opening scenes contrast the American and Japanese positions. Japanese imperialists decide to stage the attack. Even the entrapment of a Japanese submarine in Pearl Harbor before the attack goes unreported. Read More Sinopsis. 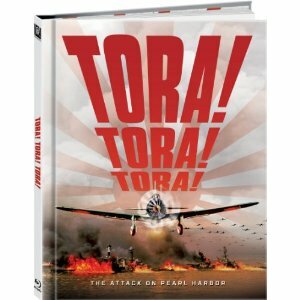 0 Response to "Blu-ray Release Tora Tora Tora"